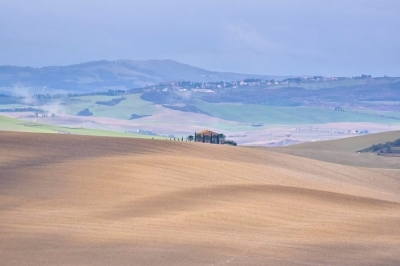 The Val d'Orcia is a cultural landscape made out of farmlands and fortified villages on hilltops. The landscape as it unfolds nowadays was created by wealthy Siennese merchants in the 14th and 15th centuries. The farms cultivate mainly grains, vines and olives. 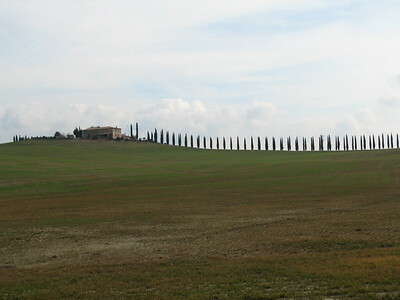 Rows of cypresses are also a distinctive sight. The beauty of the area inspired Renaissance painters and early travellers on the Grand Tour alike. ICOMOS only had meagre praise for this site when it evaluated inscription as a WHS. Not enough detail and no comparisons were supplied by the Italians. There's also the issue of the City of Pienza, which is considered to be a key part of the Val d'Orcia but was already a WHS in its own right. Both sites should be combined into one. Although the landscape is pretty enough and quintessential Tuscan, this is a poor WHS. 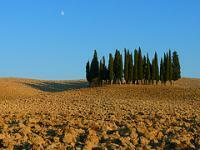 It has hills, olive trees and rows of cypresses. And there are still a lot of monumental farms around, although most of them seem to have been turned into Bed&Breakfasts. My choice of sites to visit in this valley was limited because it was a Monday, the day that almost all sites in Italy that have paid access shut down. So no castles, monasteries, baths or mills for me. I just drove around a bit, taking some lesser roads, on my way to Orvieto (on the Tentative List, see separate review). My first stop was at Castiglione d'Orcia. This town looks glued to the rocky hill where its built at. There are some nice old stone houses, and narrow streets to lose your way in. Closeby is Rocca d'Orcia, one of the most characteristic fortresses that adorn the hills in the Val d'Orcia. Along the way there are also frequent signs pointing out the pilgrim's way Via Francigena. I think I encountered one pilgrim: an older man with walking sticks, braving the cold wind but well covered up in rain gear. Coming in a few weeks later than Fredrik I faced neither snow nor cold. And at least in the morning when I departed from San Quirico the weather was great for a hike. I followed the historic Via Francigena from San Quirico to Bagno Vignoni with a stop at Vignoni and got great views of Ripa d'Orcia and Rocca d'Orcia. San Quirico itself is nice with it's cobble stone streets. 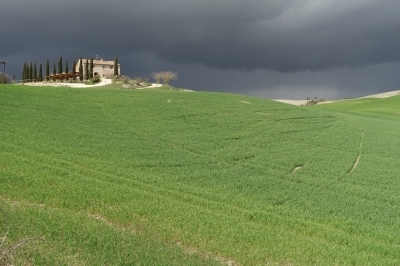 Only after I had left Bagno Vignoni and found myself stuck half way between Bagno Vignoni and Pienza with no village or shelter in between, did I notice the dark clouds forming to the North. They made for an excellent backdrop for my pictures. But after checking the wind direction, I knew what was coming my way. 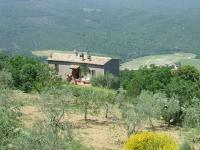 The plain Tuscan landscape may seem picturesque if the sun is shining. With heavy rains pouring down and me looking anxiously for any form of cover, some less barrenness would have helped. Lucky me, it wasn't that cold and my pants dried quickly when the clouds had passed. The hike itself was really nice, disregarding the frequent times I had to walk on the road. I got to see both the rather mountaineous side of the Val d'Orcia as well as the more hilly parts around Pienza. The area offers plenty more hiking opportunities and I really feel that this is the best way to experience it. The frequent complaint brought forward by community members is that site is redundant with Pienza already inscribed previously. While I agree that this should be one site, not two, I feel that the Val d'Orcia inscription is the worthier one. It's such a great landscape with castles and towns dotting it. To me Pienza is just a special one of those. Arriving on the weekend (Saturday) my transport options were fairly limited. I settled on an early morning bus from Siena / Buonconvento to San Quirico and hiked from there via Bagno Vignoni to Pienza. From Pienza I took a bus to Montepulciano, then another bus to Chiusi, and a third bus to Perugia where I stayed for the night on my way to Assisi. Italians seem to despise side walks. I had to walk on the road for several kilometers, not the most pleasant experience. In addition, one trail came to an abrupt stop at the Orcia river; my assumption was that the trail had been washed away. The effect from “Beast from the East” made my whole week of Italian trip on the Adriatic side of the Apennine to be miserably cold and wet, but when I crossed the Apennine to Tuscany, I was blessed with warmer temperature and some occasionally shower rain. Initially I was really happy that such kind of weather normally will create a wonderful mist in the morning, a perfect moment for photographers to make landscape photo for rolling hills of Val d’Orcia. However, when I reach Val d’Orcia area, heavy rain welcomed me, so heavy that I could not see anything except the road. I had no choice but to change my plan and directly went to Pienza. The rains continued until lunchtime and finally stopped at 2 PM, but even no rain, the sky was cloudy and rarely had sunshine, a worst element for photographing. I drove out to San Quirico d’ Orcia from Pienza, along the way there were two famous spots for shooting photo. The first one was at the entrance road to Agriturismo Podorino B&B, the stunning view of Chapel Vitaleta on green hill from here was so lovely. Another spot was the behind the grove of trees near the bus stop before Ristorante La Taverna Del Barbarossa. From here was where the famous photo of Podere Belevede which become an iconic image of lonely mansion in Tuscany made. The view was great but because of cloudy sky I was really disappointed. After that I shortly drove to see the much photographed Cipressi di San Quirico d'Orcia, a group of cypress trees on the green hill, the spot was really nice and because it was located next to the main highway to Siena, it was easy to understand why this place was quite well known, it even has small parking area just for quick snap. Then I drove south back to San Quirico d’ Orcia and continued to small village of Bagno Vignoni, on the small provincial road of SP 323 there was a spot to take the photo of famous rows of cypresses of Farmhouse Poggio Covili. I ended my Val d’Orcia trip at the white cascade of hot spring at Bagni San Filippo. Val d’Orcia, in my opinion, was the beautiful landscape of Italy, the color of soil did help the effect of brilliant color of fields, and farming landscape was also almost perfect for photography that was something that not a work of nature but well planned human design. I really enjoyed my time here and really appreciated the beauty of this manmade landscape even though it could not be considered as unique in my idea. To be honest I did not care much on Val d’Orcia’s outstanding universal value that made it to be World Heritage Site, for me this place is a great place for photography for ideal images of Tuscany and one of many must see of Italy. 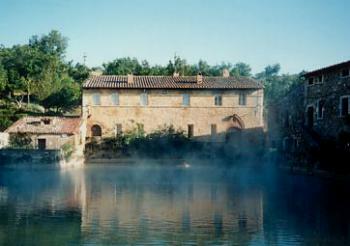 I've visited several villages in Val d'Orcia WHS as recently as last year, but my favorite is Bagno Vignoni, which I visited in 1997. This village is known in Italy today for its high-end spa, but it was also the main setting for the Russian filmmaking giant Andrei Tarkovsky's masterpiece Nostalgia (1983). Nostalgia was directed by Tarkovsky but was written by him and Tonino Guerra, perhaps the world's greatest screen writer of his generation and one of the top Italian poets, who took Tarkovsky around Tuscany for location hunting for the movie. This photo of the main square of the village, which is filled with water from a nearby hot spring, was taken by me 20 years ago and has been converted to a digital photo. It was prohibited to get in the water when I was there, but people had supposedly gathered in the water to chitchat for centuries, as you can see in Nostalgia, just like they have been doing at any other squares in Europe. The water at the square was consequently used as a metaphor for human condition to a devastating effect in the movie. Apparently, Val d'Orcia inspires artists even today. I visited this WHS in August 2013 and decided to take it easy to be able to enjoy the panoramic views, tiny villages, wineries and good food. I decided to base myself in San Quirico d'Orcia which is central to most interesting sites in the valley. I visited several places such as Castiglione d'Orcia, Rocca d'Orcia, Montalcino, Monticchiello, Montepulciano, La Foce, Chianciano Terme, Bagno Vignoni, Bagni San Filippo, etc. There is truly something for everyone here: food, wine, medievil cities, churches, art, thermal baths, hiking, photogenic landscapes, etc. I used to think that this WHS is rather redundant since Pienza is already inscribed on its own but I have come to think that it really deserves its status as a WHS and it really has an OUV if only you give it enough time to impress! A large area of rural Tuscany, the Val d'Orcia boasts endless vinyards and olive groves spread over an undulating landscape. A comfortable way of seeing this area is to take the Treno Natura from Siena on one of its periodic perigrinations - mostly on spring and autumn weekends. At other times the nearest station is at Buonconvento. From here I took buses to Montalcino and to Pienza. From both of these hilltop towns there are extensive views over the landscape. The Val d'Orcia is about two things for me: beautiful vistas and delicious wines. Staying with friends in a villa outside Siena in May 2004, I had ample opportunity to sample both. The roads in this part of Tuscany provide the archetypal imagery that has made the province famous, and the wines of Montalcino and Montepulciano are experiences in themselves. Loggia: AB evaluation "The statement of significance draws attention to the way the large farmhouses assume a dominant position in the landscape and are enriched by prominent architectural elements such as loggias, belvederes, porches and avenues of trees bordering the approach roads"